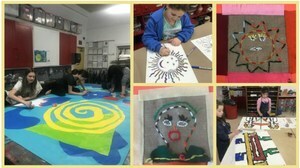 Students have been very busy in the art room since winter break! Bridge K just completed beautiful embroidered books inspired by Noah’s Ark. In this process they learned how to embroider, using large needles and colorful yarn. They drew pictures on their cloth pages using fabric markers and fabric paint. It was a multi-layered project connected to a class project on Noah’s Ark. Kindergarten has also been working on embroidery. They have just completed beautiful embroidered suns. 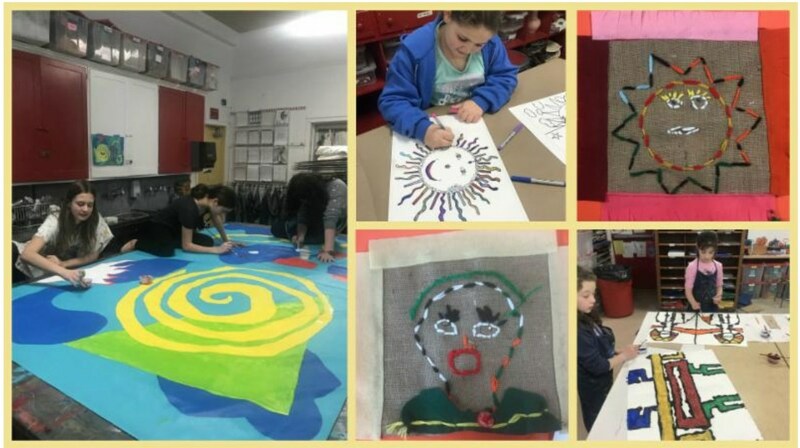 Students learned the running stitch and the back stitch to embroider their colorful suns. They drew faces with sharpie and embroidered them using the back stitch. This made their suns come alive. Fringed felt strips frame the suns. Currently these are on display in the Kindergarten room. First graders just completed embroidered and embellished self-portraits. For these self-portraits students choose facial expressions that shared an emotion. They learned the running stitch, back stitch, and some even used the chain stitch. They designed shirts out of felt to complete their amazing portraits. They are currently on display in the First grade room. Second graders just completed colorful Ndebele inspired painted designs. The process to create these designs combined printing and painting. The paintings are currently displayed in the Art room. To delve deeper into the Ndebele culture, second graders are now making Ndebele dolls, inspired by the dolls made by the Ndebele people. The excitement of learning about the culture is continuing with connecting to the actual artist in South Africa, through the Virginia Museum of Fine Arts. Jess, Linda, and I are working together to make this happen. Third graders just completed mixed media paintings and drawings of Mexican suns. These paintings have been framed and will soon be hanging in the library for everyone to enjoy. At the end of the year the students will receive their paintings back and we will reuse the frames for next year. The students were so engaged and inspired by the details they saw on the ceramic and metal Mexican suns, that they too created amazingly intricate suns. They were free to work with pencil, sharpie, watercolor pencil, and poster paint to complete their sun. Fourth grade is in the process of completing their Native American dolls. The faces have all been embroidered and the hair sewn on. Now they are busy sewing, fringing and beading the clothing. They have all become proficient at the whip stitch and all of the students can thread their tiny eye needle. Many of the students are completely independent sewers. They know how to put a knot on the end of their threaded needle and how to make the knot needed at the end of the work. These Native American dolls will be on display in Fourth grade in a few weeks. Fifth graders are creating a large Wooly Mammoth sculpture, that will live in the Tehiyah garden. Terry Lambert, Judah’s grandmother is volunteering her time to make this exciting woodworking experience become a reality. Kenton Hoover is also working with us each week to assist in making sure all the students are safe when using the wood working tools. Students have learned to hammer, use clamps, and saw. They have sketched their ideas and created small models using balsa wood. The models are on display in the art room. They will collaborate on the final design using elements from their models. The Middle School elective is working on developing ideas in their sketchbooks and then turning those ideas into collages and paintings. Currently, Beatriz Milhazes, a Brazilian artist, is the inspiration for their abstract, collage paintings. Beatriz uses a combination of geometric and organic shapes in her work. Her work is very organized, however, the result is very free and layered. The challenge for the students is to use these concepts to create their personal painting. To begin their process, the students painted their own color palettes on unstretched canvas. This canvas can be cut and layered as a collage element to create their final painting on canvas board. When completed they will be on display in the art room and in the Art Show at the end of the year. Middle School PBL is busy at work on backdrops, masks, and costumes for the play, Alice in Wonderful. Volunteers, Andrea Nemerson Hoover and Lauren Ari have been helping our students construct masks and costumes. All this exciting work will be seen when you are viewing the play. Fashion Textiles, the TAP art class, is making Monkey Sock Dolls. Although the class has just begun, the excitement around the process is blooming. The students will be sewing their own sock monkeys, and clothing to dress them. They will make monkey bags, so they can carry their monkeys around. Please stop by the art room or classrooms to take a look at some of the amazing artwork that students have been making!